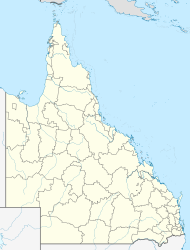 Kerry is a locality in the Scenic Rim Region of South East Queensland, Australia. At the 2011 Australian Census Kerry recorded a population of 433. Kerry Post Office opened on 1 July 1927 and closed in 1939. In the 2011 census, Kerry recorded a population of 433 people, 48.7% female and 51.3% male. The median age of the Kerry population was 44 years, 7 years above the national median of 37. 87.9% of people living in Kerry were born in Australia. The other top responses for country of birth were England 2.1%, New Zealand 1.2%, Germany 0.7%, Ireland 0.7%, Belgium 0.7%. 93.5% of people spoke only English at home; the next most common languages were 0.7% Indonesian, 0.7% Spanish. ^ a b c d Australian Bureau of Statistics (31 October 2012). "Kerry (State Suburb)". 2011 Census QuickStats. Retrieved 17 August 2014. This page was last edited on 29 October 2017, at 09:12 (UTC).